I'm a little behind on most stuff including the page for 'Homemade Meals For The Pups.' A few people have reached out asking about the crock pot meals that I make for our kids. I've received dozens of replies and messages asking for the recipe. Up until about a month ago, I simply threw everything into the crock pot without measuring. After numerous requests for the recipe, I measured the ingredients for the last couple of crock pot meals. Let simmer on high for about 5 hours. 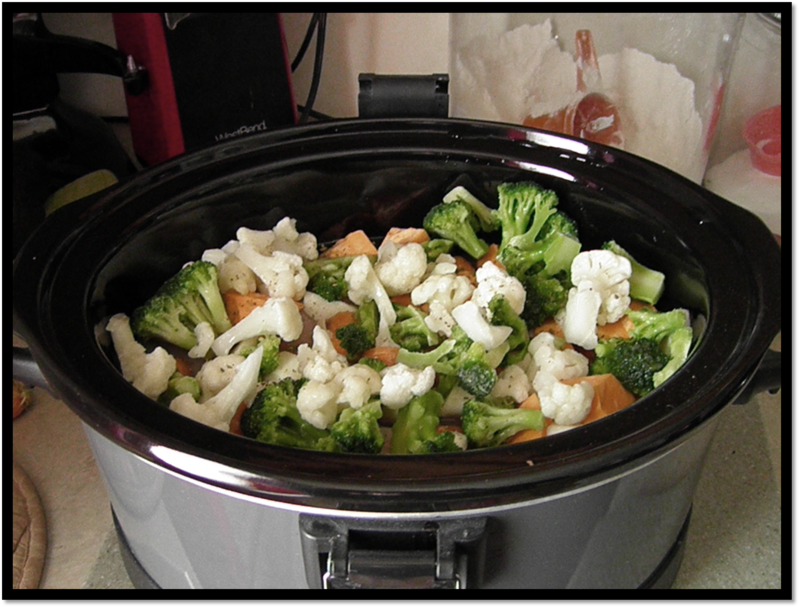 Like with ovens, crock pots vary with cooking times. What you want to end up with is chicken that shreds easily...like pulled pork. When that happens, remove all of the vegetables from the crock pot and mash them. Shred the chicken. You can do this while it's still in the crock pot. Or, you can remove the chicken and shred it in a bowl. If you do that, be sure to add most or all of the liquid to the shredded chicken. The chicken will absorb the liquid and that's a good thing. It's loaded with nutrients from the vegetables and it keeps the shredded chicken moist. You can serve the shredded chicken and mashed veggies with whole grain rice or the kibble of your choice. Even though I measured the ingredients to get an idea of how much of this or that, crock pot meals for pups is super versatile. It's not an exact science. You can't really mess this up. In other words, if you only add 3/4 cups of carrots instead of 1 cup, that's okay. 1. Chicken isn't your only option. Our kids love boneless chicken breasts. It's lean and tends to digest better than any protein we use. In the past, we tried dark meat, but that was too rich for their sensitive tummies. In addition to chicken, I'll occasionally switch things up a bit when making a crock pot meal. Sometimes I'll add 2 chicken breasts and a nice piece of steak, a handful or two of shrimp, 2 or 3 center cut boneless pork chops, or a pound of lean ground turkey. 2. Experiment with vegetables. There's a world of pup friendly vegetables out there that you can add to your crock pot meals. Experiment. The great thing about crock pot meals is that the vegetables slow cook with the chicken, or your protein of choice, and they absorb those meaty flavors. This can work in your favor if you have a picky pup. Our Coco is very, very picky about what he eats...especially produce. However, he'll eat just about any produce that simmers in meaty juices. If your pup isn't used to eating fresh produce, introduce them in small amounts. 3. Don't forget about the fruit. When making crock pot meals for your pup/s, you can add fresh fruits as well. Over the years, we've added diced strawberries, apples, pears, mangoes, pineapple, dried cranberries, blueberries, raspberries, and peaches. Again, introduce these fruits slowly. 4. Herbs! Herbs! Herbs! The crock pot meals you make for your pups don't have to be bland. You can add fresh or dried pup friendly herbs. I usually add oregano, cinnamon, rosemary, and parsley (NOT spring parsley). 5. Do your research. There are some fruits, vegetables, and herbs that are toxic to dogs. Before adding anything to your protein of choice in the crock pot, make sure what you're adding is safe for your pup/s. Take a few minutes and do the research. 6. Check with your veterinarian before transitioning your pup to homemade meals. We did this almost 5 years ago when we adopted Coco. His doctor gave us a lot of valuable information from a canine nutritionist about making homemade meals and incorporating daily vitamins. Please check with your pup's doctor before switching their diet.